Your Exclusive Source of Supplements and Products Containing G - Agmatine® (The Best Agmatine Brand). Clinically Proven Safe and Most Effective Solutions for Nerve Health and Good Quality of Life (protected by patents). More than 20 million people in the United States alone cope everyday with circumstances that challenge nervous system functions! 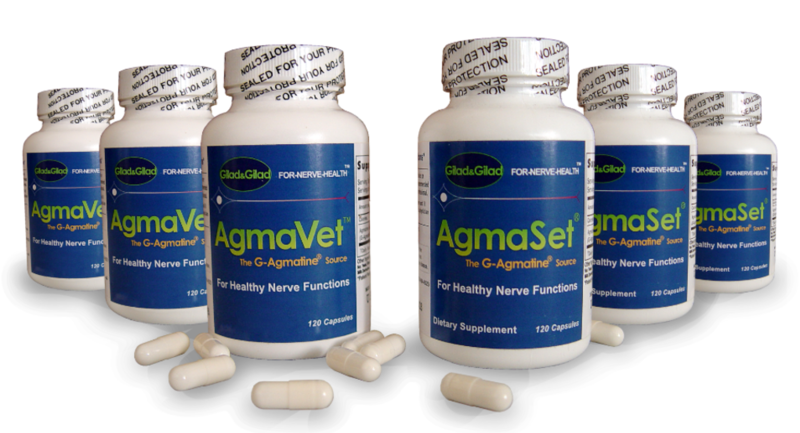 AgmaSet® is a novel, first-of-its-kind, clinically proven safe and effective supplement for nerve health. This category-leading supplement contains only G - Agmatine® - the Gilad&Gilad's proprietary brand of analytical grade agmatine. Agmatine is an amino acid metabolite, which is present in small amounts in all plant, fish and meat foodstuffs. However, our clinical studies demonstrate that consuming AgmaSet® to fortify the diet with high daily intake of G - Agmatine®, affords safe and most effective solution for nerve health. This in turn, helps you to maintain regular sensory functions and nerve-dependent muscle strength and thus, preserves good quality of life. G - Agmatine® mechanism of action is unique. It acts like a "molecular shotgun" by targeting multiple molecular mechanisms specifically critical for nervous system and peripheral nerve functions. AgmaSet® is an effective supplement for all peripheral nerves. A specific example is outstanding support of sciatic nerve health, which enables proper spine-nerve functions. AgmaSet® (for people) and AgmaVet® (for animals) are manufactured under the highest quality standards and regulations, and are available only from Gilad&Gilad and its distributors. ​​"It's clinically proven, it's tested and it works. A gift to mankind." "AgmaSet® and AgmaVet® are set to change the world for the multitudes who are in need of safe and effective products for nervous system health and for proper nerve functions ." These Statements Are Based on Solid Scientific Research and Sound Clinical Trials, and Are Supported by Real-World Evidence From Physicians' Experience and Users' Feedback. Copyright © 2010-2019, Gilad&Gilad. All rights reserved.